Discussion in 'General Knife Discussion' started by 7east, Apr 15, 2018. My name came up in the ‘lottery’ and I decided to purchase the knife. I really like it! It carries wonderfully and the blade shape has proven incredibly useful so far. Please pardon the terrible lighting/background. Lateck, 4mer_FMF, HOKIE_FAN and 7 others like this. 7east and Kreyzhorse like this. I am becoming very intrigued with these knives and entered the lottery last weekend. They seem a little larger than i normally prefer but the blade shape is very cool. 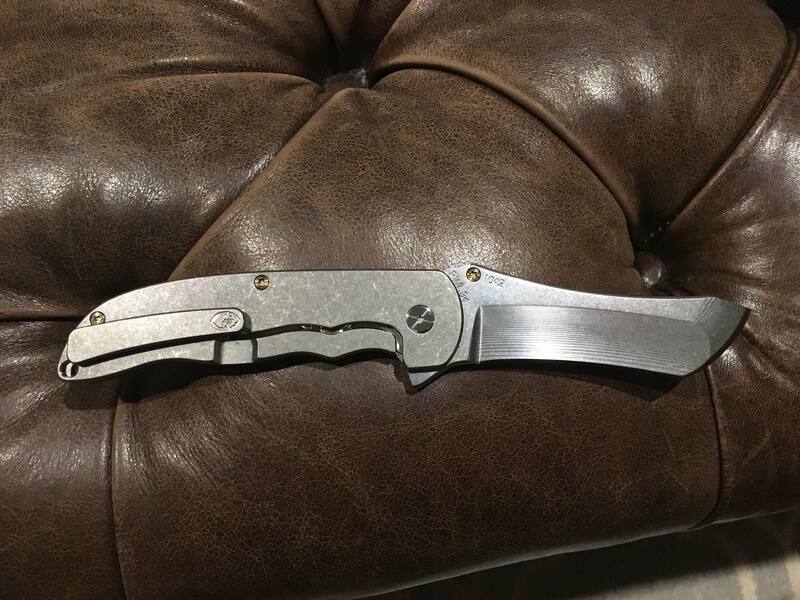 I usually carry one of my other ~3.5” knives and don’t really think this seems much larger. It’s very thin and takes up a lot less pocket than you would think. My DLT Grip, Rat 1, and Hinderer XM-18 3.5” seem to take up more pocket. I agree about the blade profile being interesting. That and the build philosophy are what pushed me over the edge to make the purchase. Very glad I did. That sir, is exaclty what I'm afraid of! Hackenslash, Kreyzhorse and 7east like this. Yup! Saying I won a lottery, but still had to pay $900 for a knife went over about as well as it sounds like it would haha. Kreyzhorse and SharpieB like this. My name came up also but I didn’t like the knife so I passed. I owned a couple back in 2012. Number 8 and 11 if I remember correctly. Wish I wouldn’t have sold them. I have never not wanted win something so bad before!!! 7east and SharpieB like this. I even had the wife and a friend sign up with their emails and nada. and seeing those after market prices make me cringe so much. I'm in the lottery too. Love the blade, but I frequently dislike the handle textures/colors. Wonder if I have the strength to pass on a handle I don't like if I ever got the email. Congrats. Let’s see it cutting stuff. I just got one also. Purchased it on the secondary market but got what I believe was a great deal (very close to original table price). The knife is awesome and as 7east said above the knife is very thin and would carry quite nicely. Incredibly smooth and the f/f of the knife is just incredible. 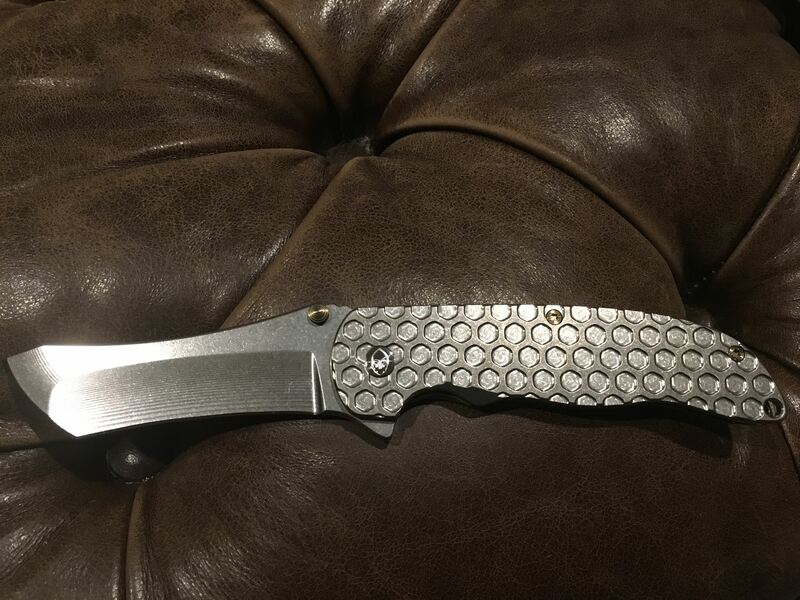 I am still registered on the lottery with Grimsmo and would probably purchase another should I get the chance. Here's the one I picked up. I HAVE BEEN CHOSEN!! BEHOLD!! 7east and Heelfan like this. I remember eye-banging these a few years ago, but ended up shying away due to the cost and the grind seeming intimidating to maintain cleanly. Nice score. That being said @7east you got a nice version. I had no idea these were now $900 from them directly. Wow. Has this had an effect on the secondary market prices?